Volunteering for the Samaritans always seemed like an obvious choice for Diogo Duarte. “If you’re not scared to talk about death and self- harm and have difficult conversations, you can make a real difference,” says the 30-year-old, who lives in Clapham and volunteers at the central London branch. He tells us he’s always been fascinated by human psychology, but it’s also his love of metal that helped him address those often tricky topics. Diogo has worked in mental health-related roles since 2010, and joined the Samaritans as a Service Improvement Officer, working on their suicide prevention and support programme for schools and colleges, last year. He volunteers on their helplines outside of his staff role. Samaritans is already active within the metal community, and have a stand at Bloodstock festival that’s open 24 hours a day for anyone to drop in and talk to a volunteer. Being able to talk openly about mental health is by far the most important aspect for Diogo. “You can learn that it isn’t this bogeyman and it is easy to talk about. We’re in desperate need of more volunteers; we put the phone down and the phone rings again. Sometimes a volunteer is the only thing that stops someone from taking their own life,” he says. The result was Rise Above, a music festival Shaun founded seven years ago. A percentage of all ticket sales goes to the charity SAVE, a Minnesota-based suicide prevention and support organisation that raises awareness through events and educational materials, conducts research and offers support to people who have lost someone through suicide. Currently, Rise Above holds 14,000 people, but Shaun says he’s hoping to expand it into other cities around the US to maximise its fundraising potential. 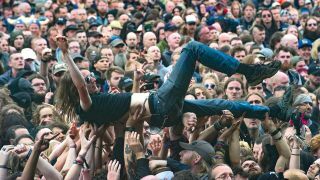 As well as the music – Korn, Stone Sour and Halestorm are among the bands who played this year – there’s also plenty of places at the festival that attendees can get mental health support. SAVE has resources and information on their website for US residents who want to set up an event, but here in the UK, Mind also provides ideas, support and fundraising packs to anyone wanting to set up an event in the name of mental health. “My passion is equality,” says Stewart Lucas, Chief Executive of the Lancashire branch of Mind. The 46-year-old dad has worked for the mental health charity for the past four years, and took the role so he could help influence the way mental health is perceived. The judgement and bullying that some people face for their appearance or lifestyle can in itself lead to mental health issues, and that’s all the more reason, Stewart says, for people who might be considered unconventional to get involved with the cause. “It’s a decade since Sophie Lancaster’s murder but that prejudice is still there. We’d welcome with open arms more people from our community. I think there’s a feeling of ‘we like to be slightly distant and the mainstream does their thing’ but I think there’s a real opportunity there,” he says. To get people from the metal world on board, Stewart says he’d love to see Mind have a presence at gigs and festivals, similar to the Samaritans tent at Bloodstock festival. While volunteers are the “lifeblood” of Mind’s work, Steve also works closely with the public sector in Lancashire to improve the way mental health is dealt with. “We lobby local government and the NHS, trying to get them to change the way they view mental health and make sure it gets the same investment as physical health,” he says. Lobbying does have a positive effect, as demonstrated by Mind’s work around the 2015 general election. 2,500 people sent the Mind Manifesto – which addressed issues like mental health funding and treatment referral times – to their local MP, and 100,000 people signed a petition on funding that was delivered to 10 Downing Street. In 2015, the Chief Executive of Mind chaired the Mental Health Taskforce, which set out a five-year plan for the NHS’s mental health strategy. The downward spiral: Why is depression on the rise in metal bands?